Over the weekend I painted most of the downstairs, and while painting I listened to Oprah’s “OWN” channel. I must admit that I am more a former Oprah fan. I enjoyed her before I felt that she became “political” with her prime time talk show (it has been several years since I’ve been a regular viewer). I am not a big TV watcher any way, but recently I’ve come to appreciate Oprah’s message once again. How did she win my heart back? With one show. Super Soul Sunday. That was why I turned to her channel while painting and over the course of several hours I got a real feel for what her current message is today. Something that I really used to enjoy (the real hook for me) was her focus on self-improvement and developing insight. I think that she continues to offer shows with that aspect, but now is working on helping people to develop spirituality as well. Anyhow, by the time I was nearing the end of my painting frenzy, her Life Class came on. I didn’t expect to find myself drawn in and as emotionally engaged as I became. This show discussed Daddyless Daughters with Iyanla Vanzant. I went away asking myself why me, a woman who was raised with two parents (who never left me) came away with abandonment issues of my own. As a matter of fact, most people I know have some sort of “issues” connected with abandonment. Why is this? The show talked a lot about divorce and the children that sometimes are left behind, but again, this was not my case. Well, it is my belief that the disconnect that we feel may come somewhat from disappointment in our relationships in life. It is inevitable that we are going to be disillusioned and/or let down here and there. Yet, I feel that it is bigger than that–the bigger disconnect actually comes when we feel that we are not connected or aligned with our “Source.” For me that source is Spirit or God, but for others it may be the Universe etc. When we feel disconnected, we feel alone–even abandoned, but this is not the case. It is us who has moved away from the Source. It is there if we will yet seek it and align ourself with light and love. I’ve asked myself so many times why working on writing or art brings so much peace to me and why when with other pursuits I may get caught up with old, unhealthy patterns such as “people pleasing” or “over committing” (the behaviors that may sometimes associated with women who have abandonment types of experiences). 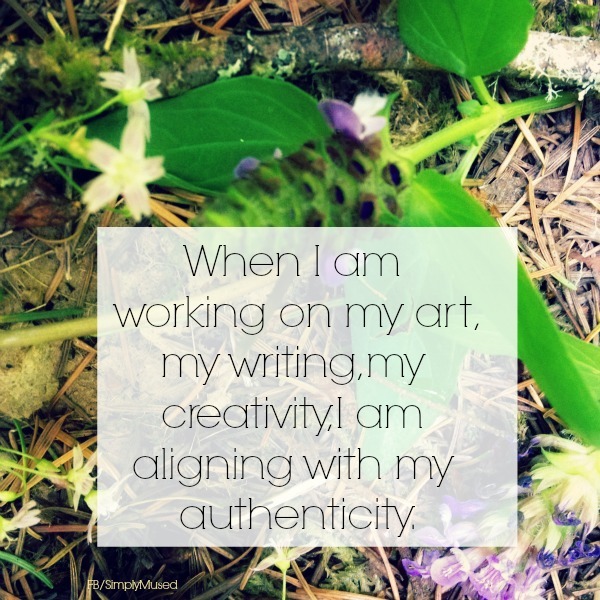 I believe that it is because when I am working on my art/writing, I am working towards being authentic, not some other Michelle that other people expect me to be. For me, this is two fold. Being creative is a habit that I am cultivating and feel very comfortable and at home with. Creativity is connected with spirituality or flow and, therefore, an activity that brings me closer to my “Source,” not farther away. So, why does the mere mention of creativity send some people running? I believe it is because their experiences with art or some other pursuit was negative, yet that does not mean that they are not creative in every area of their life. We are all making choices every day, and those choices bring us down a road of our picking. We are creating the life we are living. Sitting down and really deciding upon the life path that is wanted can bring this to our awareness, but even without awareness, we are still creating our life for better or for worse. Setting intentions and working toward those can be tough, but with the simple awareness, we can develop and create the life we seek. When we realize that creativity is connected with spirituality, things become a little easier–sometimes a lot easier. This realization has the power to take the pressure off of oneself to a significant degree. One reason that people may not connect up with the spiritual side of things is a distrust which is interesting because spirituality and the Source are there to help us attain peace and connection in life that we hope for. It many times means that we surrender some of our control. I understand that it can feel scary, BUT hey, are we really doing that great on our own? Maybe. But maybe not! If that surrender leads us back to our Source, then it is worth it to lose the feelings of abandonment and loneliness. It is worth it to finally feel whole and worthy of receiving love of others. it is worth it to feel LOVED, VALUED, & CHERISHED beyond our imaginations. This entry was posted in Uncategorized and tagged art, authenticity, connection, creativity, source, writing. Bookmark the permalink. Couldn’t agree more with you Michelle, I truly value your insight when it comes to creativity and connection, and I love how you explore the link between creating and authenticity. Great blog! beautifully said… resonates immensely with me right now… it feels like it’s just flowing out of me and I don’t think I’ve ever felt so full… I’m so ‘full’ of fulfilment because I’m doing what I feel I need to be doing from my very core somehow. Thank you!! !